Happy Sunday, friends! Cupcake Inspiration Challenge #81 is sponsored by Raindrop Echo Designs, who has generously provided the CIC DT Sweeties with digital sentiment stamps to work with. I chose to work with this Halloween Ticket Sentiments image, which I colored using my Copic airbrush. Aren't the cupcakes in this week's inspiration photo just adorable? I continue to be amazed by the talent of those who can decorate cupcakes so beautifully. I hope this inspires you to create a fabulous project! 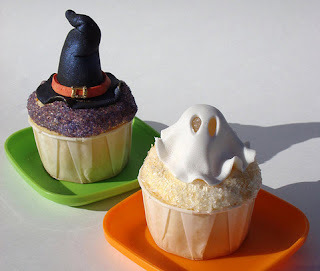 Just mosey on over to the Cupcake Inspiration Challenge blog to participate. I can't wait to see what you make! Also, don't forget to check out the projects made by the rest of the CIC DT Sweeties (links are located in my sidebar). Have an absolutely fabulous day! Delightfully Frightful! Frankenbride is just awesome and I love how you colored the ticket green - it really pops. Great DP too. Woot! Lurve this card, Neeter! The image is frightfully divalicious! One frightfully fun image and card! Thanks for playing along with the CP this week! Hi Anita, I love this card!!! I think Frankenbride is so pretty!!! I love the curves on these ladies!! Oh and your coloring of her looks awesome!! I soooo love Frankenbride!! I wish she was digi too, but can't wait to get her in rubber when she is available....love this creation!!! I love this! She is delightful and spooky. What a fun shade of green - perfect for Halloween! Cute card Anita!!! Thanks for the comments on my blog..you are always so sweet!